I have been using an eye cream since 2007, however recently I decided to take my skin care regime a notch up. Giving special care to my eyes and over all skin tone. When Vine Vera contacted me, I did my research on the company and found their products to have high grade ingredients and rave reviews. I opted to try their high-potency eye creme. In spite of its price tag, I am happy to inform that it works like magic. And since you require only a pea sized amount daily, it will last you for a long time. It provides the hydration and contouring the eye area requires. It will surely leave your eye area feeling youthful and firm. I would highly recommend this product. I love 'Simple' products as they are gentle on my skin. This is one of my favorite products I have purchased from their line. It is rich, creamy, and gentle with no smell. I love it as it cleans impurities as well as make residue. I alternate this between the other cleanser I use. It provides a good balance. In my early teens I was excellent about taking care of my body head-to-toe, however with time I had gotten lazy. Lately, I have been trying to get my act together. This is where a foot creme enters my daily morning routine. I have been applying this lavender and eucalyptus foot creme daily and can already see a difference in the appearance of my feet. Let's just say they are summer ready! This is another piece of the puzzle. Natural granulated pumice thoroughly exfoliates the rough skin on the feet, leaving them velvety soft. Using the foot scrub twice a week followed by the foot cream has been a great combination. I purchased this scrub from a stand alone local Shiseido store. I haven't been able to find it at any major retailer. However, it is available here. I love this scrub as it is gentle, and you can literally see your dead skin come off as you massage it into your skin. Your face feels softer and even textured with each use. 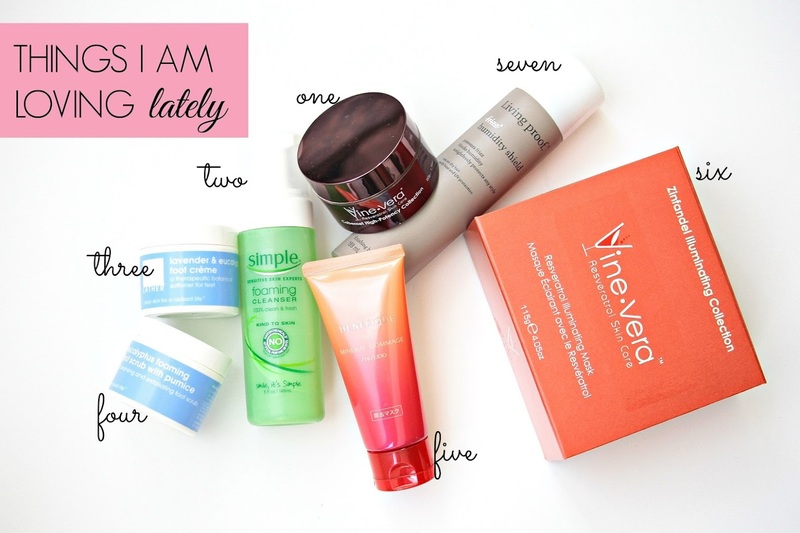 After the eye creme this is my next favorite product from the Vine Vera line. We already have heard the health benefits of resveratrol in out diet, now it has been introduced into your skin care. It helps reduce age spots, sun damage, discoloration. All the issues I have with my skin. After using the above scrub, I follow it up with this rich and creamy face mask. I leave it for 15 minutes and voila! I have skin as soft as baby's bottom. I am not exaggerating. It feels so good, I only wish I had time to repeat this routine daily. I am in love with Living Proof Frizz product line. When a product delivers, you cannot help with rave about it. However, the humidity shield is my favorite. It protects your hair in the horrid (D.C.) humidity without making it limp and lack-lustre. I couldn't recommend it enough. You would have to try it to believe it. Love the sound of the Shiseido Benefique Mineral Gommage, the packaging is super pretty too ! I like the pretty Packaging..
Oooh.. nice. I haven't tried any of these but I will look into a couple. Thanks for sharing.